From www.1stpaygateway.net, click Sign In at the top right corner. Select Transaction Center, or log into the Transaction Center directly from here. Enter in the Transaction Center ID, Username and Password. If your account is Multi-MID, you will be presented with a dropdown that allows you to select a MID to access. 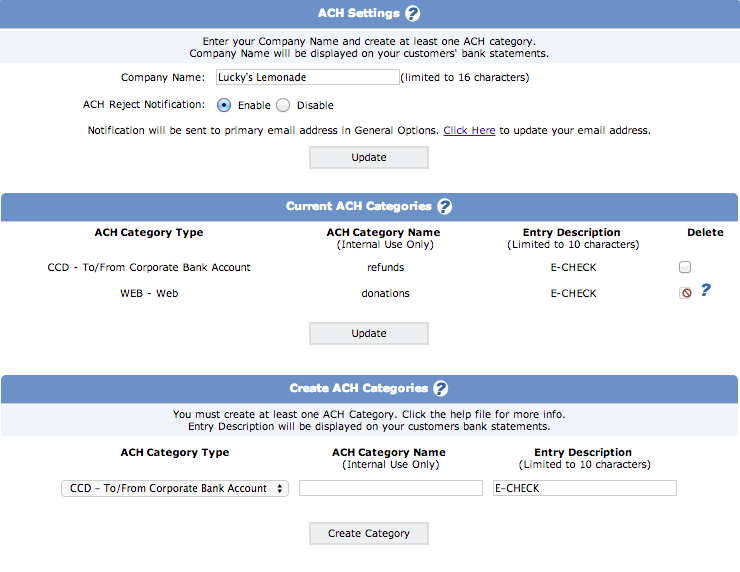 Select your ACH MID and click Submit. Under the DELETE column, click on the checkbox next to the ACH Category you'd like to delete. Click the Update button. The webpage will refresh and the ACH Category will no longer display under the Current ACH Categories. STOP HERE/READ: Before Deleting any ACH Categories, first see if there are any ACH Category Types that have recurring transactions. If recurring transactions exist, the delete column will display a QUESTION MARK ICON. When clicking on the QUESTION MARK ICON, a message will appear noting that the category has pending transactions or recurring transactions scheduled. If there are recurring transactions in this ACH category and you can successfully void ALL ACH transactions, then and only then can you delete the ACH category. Log into the Transaction Center here. Article written by Susan L.